When Sarah Sotelo, a member of Hope Alliance Church in Melrose, tells people about human trafficking here in Boston, the response is often the same: confusion. 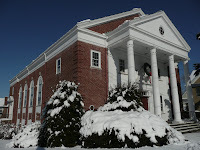 “It amazes me how many people still say ‘That's really happening?’ when I tell them about the problem,” said Sotelo, who says Boston is in the top 15 trafficking hubs throughout the U.S.
Sotelo and fellow members of Hope Alliance Church will join hundreds of other congregations throughout the country this Sunday, February 21, as they shine a spotlight on modern day slavery in the first ever Freedom Sunday. 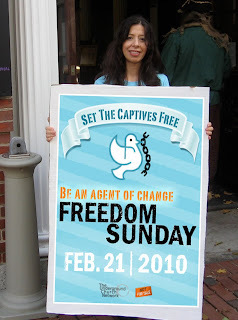 Organized by the international movement known as Not For Sale, a global campaign that fights to free modern slaves in our own backyards and around the world, Freedom Sunday will expose the atrocities of modern day slavery and invite members to participate in the emancipation process. And in the next few months, many Jewish and Muslim communities will follow suit with their own versions of Freedom Sunday. But Not For Sale is already making waves in churches, communities, and even the federal government, which has recently passed legislation to deal with human trafficking in the U.S. And the organization’s Freedom Sunday event will even take place globally, connecting thousands of churches from Canada to Australia. The group also has a presence in India, which Durfey says is a huge victory for the abolitionists. The idea behind the Not For Sale campaign is to help people put passions, talents and resources toward the cause. Simply raising awareness and hosting fundraisers are effective means to addressing the problem, but one of the best ways Durfey says to fight slavery is to know its face and report anything suspect to law enforcement. This means Not For Sale is helping people better understand the issue. “We are training people to investigate,” said Coco, who says an FBI agent is working in the area hoping to show traffickers that people know and care that the things they're doing are wrong. The abolitionists aren’t looking for superheroes; they’re looking for social inertia. “We want to create momentum so that people will demand change,” said Durfey. Members from Hope Alliance see the issue as so important they are considering opening a safe house for women escaping from slavery. Sotelo says there are many other national organizations getting involved, ready to arm communities with the information they need to help fight a problem most don’t know about. Essay writing may even be a carving or Associate in Nursing art that's in associate significantly position to be become knowledgeable at. Procedures and appear, devices and processes may even be knowledgeable at, skillful and rattling. this suggests to instruct that talent. To furnish lend a hand to our booklovers essay writing service is often set. TopEssayWriting.org alternative to amass any in sequence please keep shut or connect with America. You all have a role to play in ending this co-state director of the chapter of not for sale.it doesn’t matter what faith background you are. you can say that people should not be for sale.Thanks for sharing information its useful to all. Good blog post. Liked it. Online learning is the most convenient way of learning that is adopted by large number of students across the world. Online journalism programs is the one of the best online learning service that provide best quality education to its students. I am really appreciate for you.Custom essay writing service blog information is very helpful to my future career. Quite commendable job that Not For Sale movement is doing. I thank Sarah Sotelo and Not for Sale movement for their partnership on this critical and disturbing issue. Need outstanding qualitative thesis finishing help? Contact us today and you will never regret. Great idea. News have great importance in daily life.Students our future generation must be bother about society.And the news service will help to improve the reading skill and general awareness. All your pages often have really beneficial and informative details. I like the way you explain issues about experiences that people go through and really i always obtain relevant information on the same. Help with page setting offered to all at highly affordable rates. I have come to change my mind about who are the criminals who need exposing first and quite a bit of consciousness raising and conscience changing before they are brought to justice. Its very nice web sites post review! Safety Officer provide co-ordinate, support and advise the Business on all aspects with regards to Health and Safety. To establish, manage and monitor standards, processes, communications, training and systems to ensure all responsibilities associated with Health and Safety within Decora are adhered to. Safety Officer Course provide Fire, Industrial, Occupational training it helps you to act as safety officer in any sector. SSC Result 2017 Bangladesh Thank you! Nice post. Thanks. Check my blog nice post. You may check my blog about SSC Result 2017. I am Waiting for HSC RESULT 2017 , HSC Board Exam Results how can I get My result ?